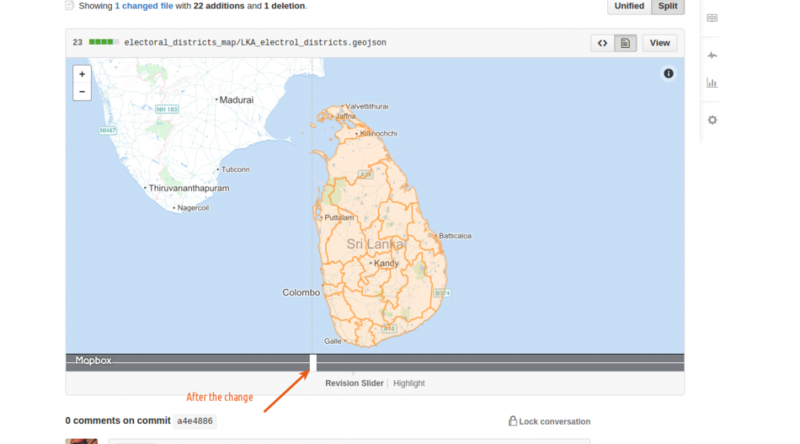 SriLankan maps for Electoral districts are available for download now. I initially made this for a friend who wanted to analyze the election results. The Electoral districts are derived from the administrative maps. You can check the diff on github to see how the maps were changed. GeoJSON.io for converting from KML to GeoJSON and adding attributes. GitHub for storing the map files. Note: I don’t provide any guarantee on the accuracy of the maps. So don’t use if you want accurate maps. I have made notes on how these maps were derived. Use it if you think the process is right. Raise an issue if you find anything. Previous PostGuest Post: Varun Goel- Releasing Data for AgricultureNext Post2nd Open Data Camp Delhi!